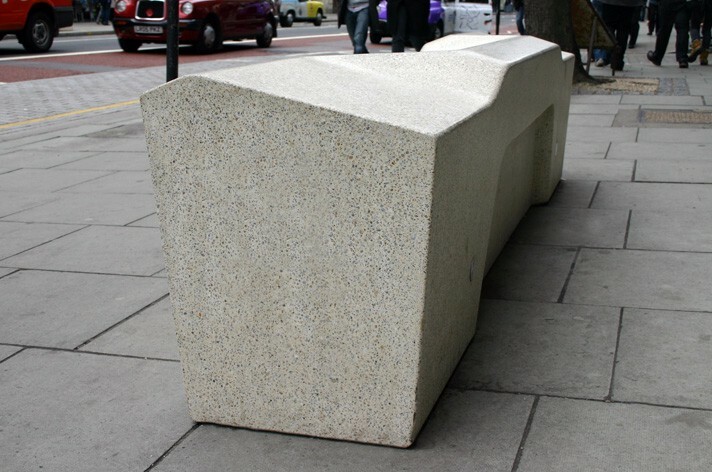 As such, the Camden Bench is a strange kind of architectural null point. A piece of the city that by design will not interact with it in any way. It is a bench by the slimmest of margins — hardly comfortable, affording none of the qualities that would make it more than simply a place to sit. This is the bench’s sole concession to being part of the city, and it does it with the least conviction possible. I’d like to see what the Camden Bench would look like if it didn’t have to be a bench — if that final design constraint was removed, what would it become? Just some nebulous lump of concrete? Would it shrink or grow? Would it even be visible, or would it exist as a space hidden behind a physical wrinkle in the map? The Camden non-Bench would be like a hard pearl in the mouth of an oyster, of the city but not part of the city, just an inert lump. I worry that the Camden Bench is a symbol of the freedom we’ve lost in our public spaces — the freedom to use these spaces as we wish. I also fear that it is an ominous symbol of the future of Britain, a world where contrarianism — whether it be sleeping, skateboarding, scribbling — is made not just illegal, but impossible.